Most of us never get around to framing our diploma and if we do it usually ends up in a box up in the attic. Your special graduate can be reminded of her great accomplishment every time she wears her bracelet. 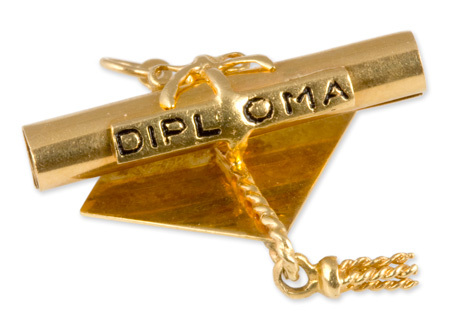 Charm consists of a rolled diploma on top of a mortarboard hat with braid and tassel. Marked 14K. 25.4mm (1.00in.) wide (the diploma). Weight 2.7 grams.